After several intense days of conducting surveys outdoors on a golf course, I am very happy to be back in my office with a big pile of responses to compile, analyze, and report on. Don’t get me wrong – I love working outdoors, and acting as Survey Captain with several wonderful assistants at the 2014 Manulife Classic was a fantastic experience. There’s something extra special, though, about being able to sit down and put together individual responses into a holistic picture of an issue or population. Surveys are one way of approaching this larger picture. I will enter all the check-marked boxes into a spreadsheet, from which I will analyze the numbers associated with each response (e.g. 50% of people agree on ‘X’). However, this process means that the survey respondent cannot bring in their own unique perspective. What if I neglected to ask a question on the survey which is important to the respondent? Interviews, in semi-structured or open-ended format, are one way of getting at this rich and often unexpected source of data. Even more than surveys, I find sitting down to transcribe these kinds of interviews the best part of any research project. Transcribing is the process of making a written copy of something that has been dictated – in this case, a series of questions and answers. Although you can have a computer program (e.g. Transcribe) translate audio into text for you, I find it much more valuable to go through with a human brain and add notations, insights, and issues for later follow-up. 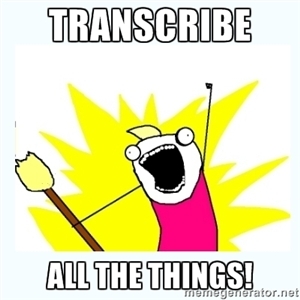 Transcribing is thus an incredibly soothing process that can lead to an almost meditative state of thinking, writing, and reflecting. Anyone with an audio recorder and the permission to conduct an interview can try it. You may find it useful for gaining deeper insight into anything from business meetings to personal issues. The information produced can also help you gain that sometimes-unexpected perspective into issues that are important to other people, as well as create a holistic picture of an issue or population. Previous Post Blog Anniversary: 200 Posts!